Get Creative This Halloween – arts, ink. With Pinterest and tumblr becoming more common and popular, it pushes the everyday person to want to take Halloween to the next level. This means decorating the entire house instead of just the porch and front room, and only making Halloween themed food for every celebration, as well as only wearing homemade/DIY costumes. These things are super hard to achieve, and somewhat unrealistic for the average person who isn’t amazingly artistic like everyone on Pinterest seems to be. A new trend that has begun on Pinterest is to paint a pumpkin instead of carving one. This trend is a great and easy idea that people of all ages and skill levels can easily achieve. It allows you to be more creative if you want, but it’s not a necessity. Both simple and complicated designs look great on a painted pumpkin. 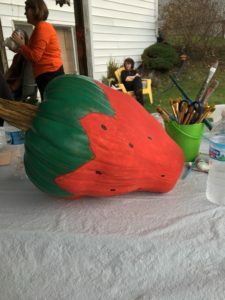 And as a bonus, if you mess up then you can just repaint the entire pumpkin orange and start over instead of being stuck with it, like when carving. Another bonus of painting pumpkins is that it allows you to get creative with the pumpkin you pick. There is no longer only two options of short and fat or tall and skinny pumpkins because those are the only two that look good with a carving, now any size and shape of pumpkin works because you can use its shape to your advantage. If you get a curved pumpkin you can make it look like a strawberry. If you get a hourglass shaped pumpkin you can make it look like a skeleton head, or a triangle pumpkin can be a witches hat. These are all also super cute and creative ideas that take little to no skill or time to achieve. The only potential downside to painting a pumpkin instead of carving it is that you can’t put a candle in it to make it light up and be able to see it at night. But that is easy to get around by putting several candles next to it or a lantern or really any light source, to be able to show off your pumpkin in the dark. This means that there is no downside to painting a pumpkin instead of carving one. Will follow the new trend this Halloween?